Hello Summoners! Welcome to the Rift Raid Guide. 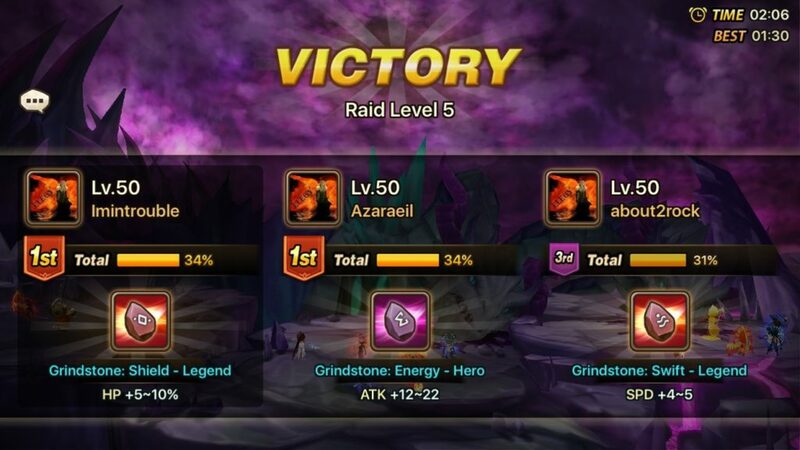 This is a three part series that will help summoners at any stage understand the basics of Rift Raiding and how to increase your chances of defeating Rift Raid Level 5 (R5). While this is not an exhausted guide, I am hoping that this content will help many people decide how to create or enhance their current Raid Teams. Please leave comments below with any additional comments or suggestions. Thanks for visiting! This guide is based on my own progression in Raids. Hopefully this will help players at all stages of the game to understand the basics of Rift Raids and how to improve your team. 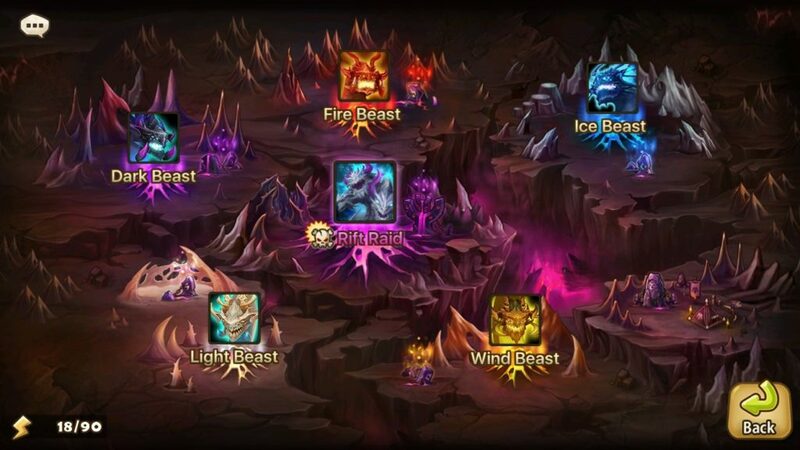 While this guide is primarily focused on R5, the overall strategies provided in this three part guide will also apply to lower Rift Raid Levels. The meta is changing every few months with balance patches, so please share any suggestions, feedback or comments below and I will try to keep this post as up-to-date as possible. Before we get started, I wanted to give a shout out to Syntac for a guide he put together several months ago. While some of the strategies and such are outdated, it provides a great overview of the basic Raid mechanics. Please take a look at this guide as it provides a lot of great insight on Rift Raids that are not explained here in detailed. What is the Rift Raid? The Rift Raid is unique content in Summoners War that allows three players to simultaneously fight the boss together. This battle is set to auto, so you are unable to do the fight manually. 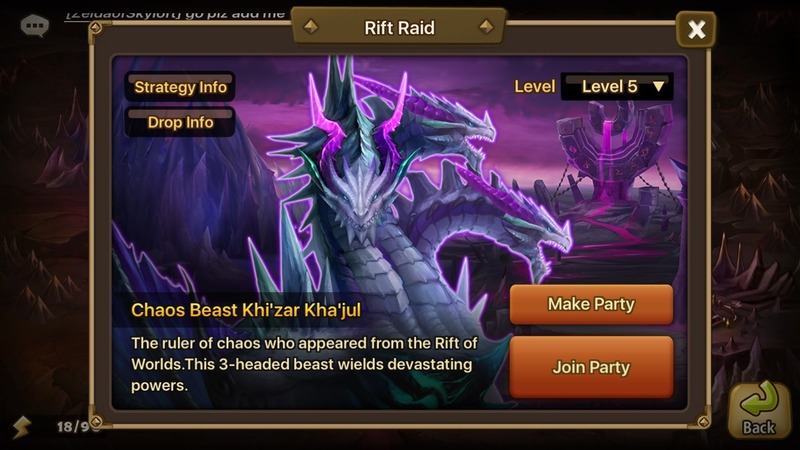 Because of this, the best way to increase your chances of successfully beating the Rift Raid Boss is by working together with the other teams to create a party that has the necessary damage and support. When you first start a Rift Raid, the first screen you will see is the unit selection page. There is a total of 8 slots available for you to place your units, 4 in the “Front Line” and 4 in the “Back Line”. The placement of your units changes how much damage your team will absorb from each of the bosses attacks. When you are ready to select units for your team, you will notice that you are only able to select 6 units, so you need to decide what formation you want to do. Having more units you have on the front line reduces the overall hp / def requirements needed on each unit. This is due to damage being mitigated over 4 units instead of 2. When you are first starting out, you may need to do a 2 Front /4 Back lineup, as you may not have the necessary stats to have four units on the front line. However as your runes become stronger and you are able to grind and convert stats, you will be able to slowly change to a 4 man front line. Below are the recommended stats needed for R5. Please note that these stats assume you are running Darion or Dias. If you are not, i’d try to increase the stats by 10-20%. Please note that these stats do not include leader skills or towers. Also when building front line tanks, having a few units well over the recommended stats minimums can really be helpful when RNG takes place. Speed Requirements: The only recommended speed stats required are for Healers and Cleansers which is ~200 speed. You will find that having lower speed will make it more difficult to sustain damage over the entire battle. Once you select your 6 units for your raid team, you will need to select a Leader Skill. Each team in the raid is allowed to select a leader skill, which is shared among all of your raid teammates units. For example, if the raid party selects “Defense”, “Critical Chance” and “Resistance”, your team will receive all three leader skills. These leader skill however do not stack, so bringing two “Defense” leaders does not provide you double the defense. Critical Chance – This allows you to build your team with 76/81% CR to ensure all of your damage deals can obtain max CR. Hwa is pretty much the staple CR leader unit. Defense – This leader skill is typically favored over HP, as it makes keeping your team healed easier. Fire Panda is pretty much the staple Def leader unit. Other popular ones include Bastet and Fire Monkey. Resistance – This is the most important leader skill. It is essential that all of your healers / cleansers have 100% Resistance once you include the Resistance Leader Skill. A poorly timed stun due to the lack of resistance could result in the death of your party. Dias is the best Resistance Leader unit, however Praha and Tesarion are both solid choices as well. This content is generally for more Mid to Late players, but anyone is welcome to experience the content as it provides a great way to be more social within the game. There becomes a certain point in every summoners wars career, where farming for runes becomes less and less rewarding. 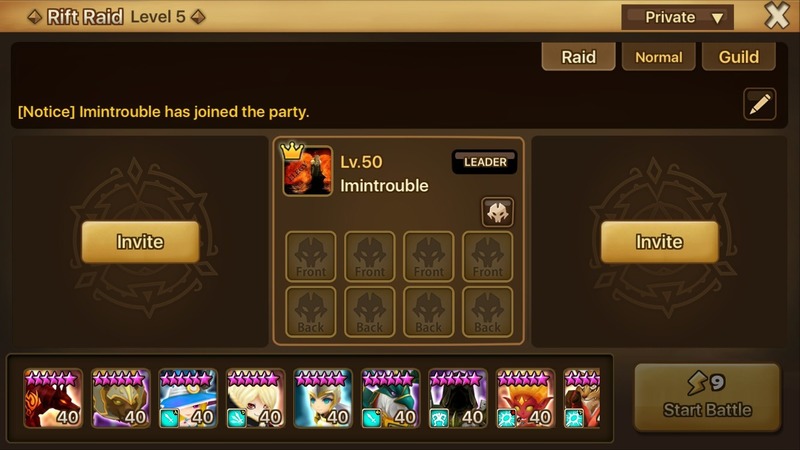 This is when you should switch to Rift Raids to enhance your runes! Otherwise you will spend a tremendous amount of time, energy and resources powering up runes that you know are replaceable. The rune requirement for the Rift Raids are quite high, so you need to make sure you have the essential stats to survive both R4. 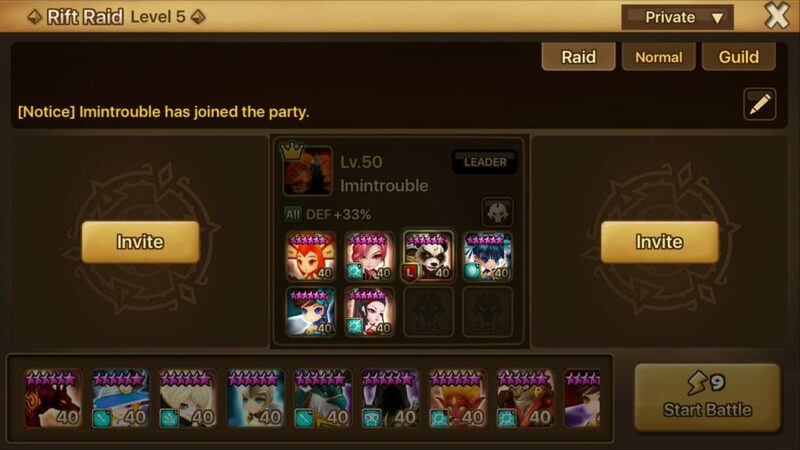 For newer players, once you are have a stable R4 team, this is when I would suggest farming Raids. There is no shame in doing R4, especially when you are first getting into raids. Farm as many grindstones and gems to power up your runes. Eventually you will be able to move onto R5 once you have the necessary stats to survive. Now that you understand some of the basic set up to starting Rift Raids, let’s take a look at the Raid Boss skills. It is important to understand the mechanics behind each move so that you can properly create a Rift Team to battle the Raid Boss. Attacks all enemies and decreases their Attack Power and Attack Speed for 2 turns. Puts them in an oblivious state for 2 turns after the attack. The harmful effect activation rate will increase as the level of the Raid increases. Targets the frontline of the enemy and unleashes an attack that ignores all beneficial effects. The damage increases substantially as the target’s Defense decreases. This attack will target the backline if there are no Monsters left in the frontline. Becomes enraged whenever an enemy gets a turn and the skill will activate automatically when enraged 16 times. Attacks all enemies, removes all beneficial effects and recovers the HP in proportion to the number of removed beneficial effects. This attack will also stun all enemies and permanently increase the Boss’s attack power. Attacks all party members whenever the boss loses 25% of the HP. All harmful effects will be removed and the boss’s stats will substantially increase when this skill is activated. Crush of Doom and Breath of Doom will gain an additional hit whenever Total Annihilation is activated. When the boss eliminates an entire team of Monsters, the boss’s attack speed will increase and will start attacking all of the nearby enemies. The damage of the next attack will increase in proportion to the number of the enemy’s turn. The damage will reset after the attack. what is droping at level 1 rift? Really great guide, as always! I just have two more questions regarding raids. What I just don’t fully get is the front/backline mechanics. If i Have four mons up front, the required stats for them are lower individually, so basically easyier to rune all 4 of them, right? Isn’t a 2 man front better in the long run? So i can put 4 mons on full damage and 2 fully on tank? Or is there another disadvantage for backline monsters? My secons question is regarding accuracy. For gb and db there is a required minimum for accuracy regarding strippers/debuffers. Is there a minimum here as well for my debuffers? As for your 2nd question, you’ll only need 15% Accuracy. The Raid Boss has REALLY low resistance. So for the recommended stats did you calculate them with maxed building? or is it ok to be a little under, but having maxed hp and def building? Thanks for all the effort i could learn a lot here! Where can I find R4 HP/Def requirements? i haven’t done any extensive R4 in a while, but you can probably be 10-15% less tanky up front. I’d still keep the same backline requirements.